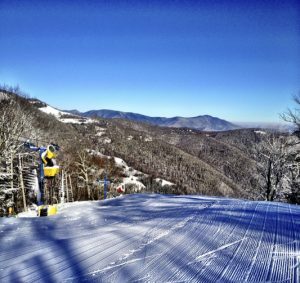 Cataloochee Ski Area boasts the south’s premiere snow making capacity, and often extends the skiing season to over 100 days. A wide variety of slopes feature something for the beginner to the expert. Come out and see what Great Skiing in The Great Smokies is all about. In the Valley is the Tube World. Making snow from mid December to March, sliding down the hill is a family favorite not to be missed. You can check the current conditions for the ski area and the tube world at anytime at www.cataloochee.com or click our webcams page to see live cams from the ski area.